Safari Bed Leopard w/Cord Trim. 32"x23"x13"H 31/2 inches off the ground. Everyone loves this classy exotic fashion statement. One of our favorite beds! 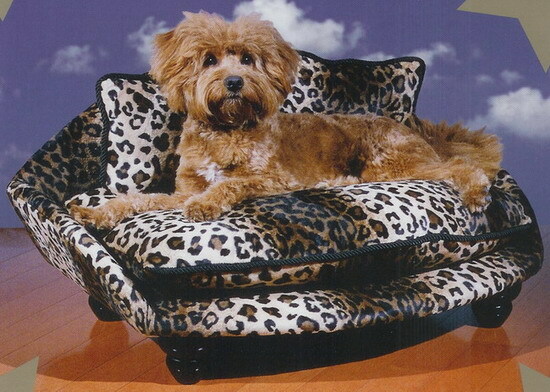 It will be the talk of your party and your dog will love it too !Each Piece is lovingly crafted by hand with a sturdy hardwood frame and fine luxurious fabrics. Pillows are filled with soft high quality poly fiber and a strong synthetic fabric preserving the beds loft and resiliency. Removable slip covers can be washed or dry cleaned, according to the chosen fabric. This one can be hand washed. You will love it and so will your baby.